Prepare for the long haul! THB-204: eGlideGoodies offers another sturdy towing hitch, this one for the Indian. 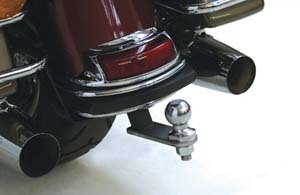 This classic 1 ¼'' receiver hitch mounts directly to the bike's frame with provided graded bolts for a secure fitment. 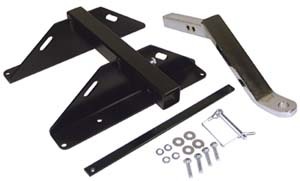 This hitch includes standard anti-chatter bolt to remove excess movement from the hitch receiver, improving the pulling smoothness of this hitch system. Designed to fit 2014 and newer Indian Chiefs, Springfield, Chieftain and Roadmasters. Made in the USA. THM-03: Trailer hitches are fabricated from laser cut steel, hand welded then powder coated. Bolts directly to the frame in minutes. Does not include hitch ball. Made in the USA. Fits Tri-Glide 2009/2010. THM-04: Trailer hitches are fabricated from laser cut steel, hand welded then powder coated. Bolts directly to the frame in minutes. Does not include hitch ball. Made in the USA. Fits Tri-Glide 2011 to current. THM-05: Trailer hitches are fabricated from laser cut steel, hand welded then powder coated. Bolts directly to the frame in minutes, Does not include hitch ball. Made in the USA. Fits Dresser models 2009 to current. THR-14: Designed for the 2014 and newer FLH/FLT frame, laser-cut from high tensile strength steel, and TIG welded by hand for superior fit. This vertical receiver hitch has a chrome tongue, which installs in seconds without tools to keep that clean look on your bike when not towing a trailer. 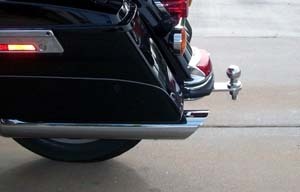 Simple bolt-on installation, mounts to the bike at five points for superior rigidity.When installed the black powder coated hitch is hidden and virtually invisible without the chrome tongue. Kit does not include ball or wiring. 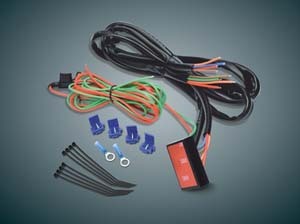 See THR-614 (Premium Weatherproof 6-Wire Trailer Connector Set), THR-14W (Plug-In Trailering Wire Harness for Harley 2014 FLH Models including Classic and Ultra Classic, Ultra Classic LTD, Street Glides, Road Glides, Tri Glides, and Fits all CVO, Screaming Eagle Versions (with the EXCEPTION OF ULTRA LTD CVO) Of These Models), SD-50 (Signal Decoder For 2014 and Newer Harley-Davidson FLH CAN-bus Trailer Wiring ), THR-IU-07 (Universal Trailer Wiring Isolator), HB-B 1-7/8” Aluminum Ball) and HB-C 1-7/8” Chrome Steel Ball. Fits 2014 and up FLH/FLT Touring Models, with/or without filler panels. THR-09: Designed for the 2009 and newer FLH/FLT frame, laser-cut from high tensile strength steel, and TIG welded by hand for superior fit. This vertical receiver hitch has a chrome tongue, which installs in seconds without tools to keep that clean look on your bike when not towing a trailer. 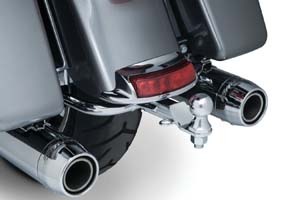 Simple bolt-on installation, mounts to the bike at five points for superior rigidity.When installed the black powder coated hitch is hidden and virtually invisible without the chrome tongue. Kit does not include ball or wiring. See THR-13 (Sub-Harness for FLH/FLT Harleys®, 1997 & Newer), THR-28 (Sub-Harness for Harley® CVO Models), THR-38 (Sub-Harness for CVO SE Models). Fits 2009-2013 FLH/FLT Touring Models, with/or without filler panels. 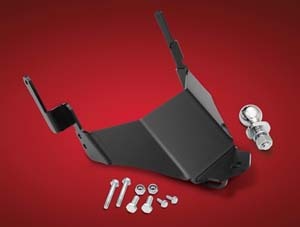 NOTE: Fits Road Glide and Street Glide models, with the use of Tail & Brake Fender Light, for FLTR & FLHX Street Glide and Road Glide Custom, Red or Smoke, THR-7100, TRH-7110, THR-7105 or THR-7115 below. THR-09-T: This super-strong receiver type hitch is the finest available. This U.S. made hitch is fabricated from laser cut steel, hand welded then powder coated - and bolts directly to the frame in minutes. The tongue and 1 7/8” ball are triple chrome plated. The receiver is almost completely hidden and the tongue installs easily using a hitch pin and clip. 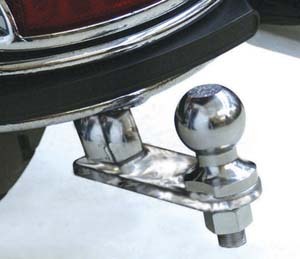 This hitch is made for use with or without Harley-Davidson’s optional rear bumper. Tongue height is 11”, which accommodates most trailers. Note: Does not includes plug-and-play wire harness. Fits MY '09 and '10 only. THR-11-T: Same as above for MY '11 to '14. THR-TG-5S: U.S.-made from laser cut steel, hand welded & then triple chrome plated. 8” height tongue is designed for extra-low trailers. Easy install with hitch pin and clip. Shorter and 3 3/4” closer to the ground. Ball not included. THK-57: Ensure smooth sailing and eliminate any fear of the "trailer shimmy" with our sturdy forged and welded steel receiver hitch. 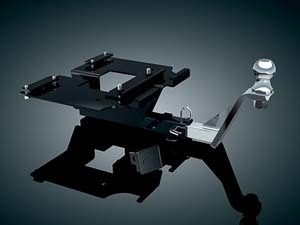 A unique dual receiver design means the ball mount assembly engages the hitch frame vertically on both sides for optimum structural support. Fits '14-'17 Electra Glides, Road Glides, Road Kings & Street Glides. THK-53: A rock solid trailer hitch can make the difference between smooth sailing & a white-knuckle ride. Our permanent mount hitch attaches at six points. Visible parts are bathed in lustrous chrome; hidden components are black powder coated for maximum rust protection. The kit includes all mounting hardware & a 1-7/8” ball. 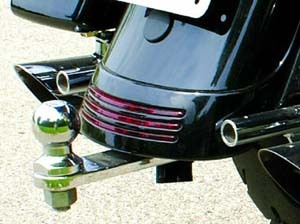 Receiver Hitch (ea) Fits: '09 - current Tri-Glide Ultra Classic & '10 - current Street Glide Trike. THK-091: New Receiver Hitches for 2009 to 2013 Touring Models are outstanding in many ways. Completely bolt-on, there are no modifications required! Fits Dressers and Road Kings. Full-Dresser function with striking good looks. Fits:Touring Models. A rock solid trailer hitch can make the difference between smooth sailing & a white-knuckle ride. Our permanent mount hitch attaches at six points. Visible parts are bathed in lustrous chrome; hidden components are black powder coated for maximum rust protection. The kit includes all mounting hardware & a 1-7/8” ball. Fits: ’09-’13 Electra Glides, Road Glides (except ’09 FLTRSE, ‘12-'13 FLTRXSE), Road Kings (except '13 FLHRSE) & Street Glides (except ’10-’12 FLHXSE). 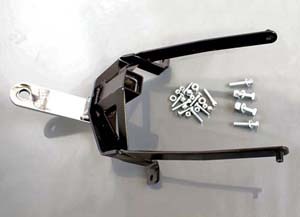 THK-83: Trailer hitch receptable for THK-08. 5-Pin receptacle with a chrome mounting bracket. 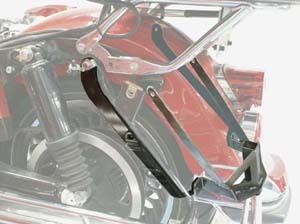 THB-120: eGlideGoodies delivers another sturdy towing hitch, this time for the all new Yamaha Star Venture and Eluder. 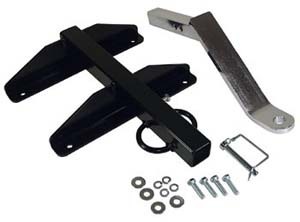 Tow your favorite trailer safely and securely with this hitch that mounts directly to the bike's frame and sub-frame with providedgraded bolts for a secure, hassle-free fitment. 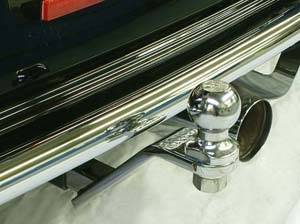 Includes 1 7/8" hitch ball. Made in the USA. THK-58: Trailer Hitch Ball Cover. 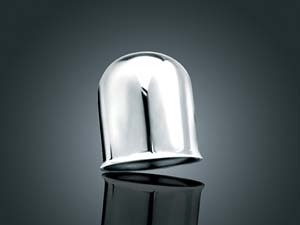 Shiny chrome ball cover fits all 1-7/8" and 2" balls. Includes a foam l ining to ensure a good fit. 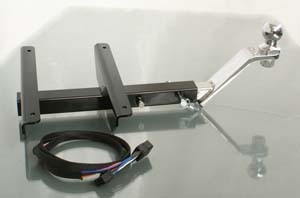 THF-SE: Special Order Reciever Hitch for Screaming Eagle and CVO models. Please specify model and bike model year. 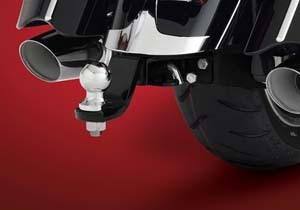 This Hidden Trailer hitch for '09 and up CVO Street glide, Road Glide, Limited. Pull your extra load with confidence using this hidden hitch assembly and show no signs of the hitch when it's not in use. Receiver and ball are included with each hitch. Ball is 1-7/8 with 3/4 x 1-1/2 shank, chrome. Polished stainless steel. 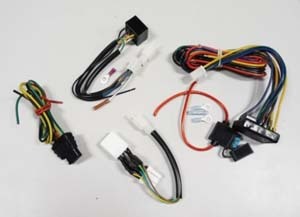 THF-SW-4/5: Special order CVO wiring kit for THF-SE. Kit includes: Relay Package, Relay Converter, Relay Sub Harness, Multi-Terminal Plug. 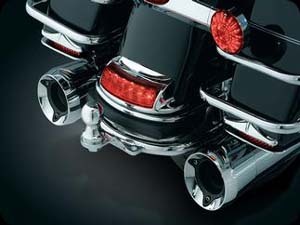 Plugs directly into H-D models as indicated on each part description. This is a direct plug-in into bike wiring to draw power direct from battery. An in-line fuse prevents surges/shorts from impacting your bike. TL-125: As motorcycles get more complex with electronic ignitions, fuel injection, ABS braking and other sensitive electronics, isolating electronics between your motorcycle and trailer is critical for sale riding. This Electronically Isolated Trailer Harnesses sets the standard for trailer to bike protection for years. 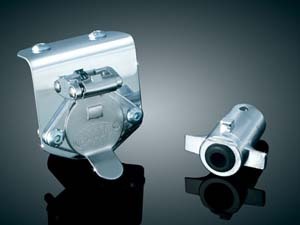 Electronic backflow is eliminated with heavy duty self-setting relays to protect your motorcycle. 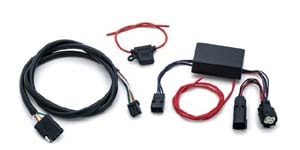 This five wire system provides direct connection for running, brake, left turn signal, right turn signal and ground. Weather resistant gel sealedsplice connectors are included to make an easy and durable connection for long term use. 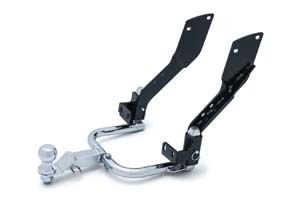 Designed for use on Harleys and other great trailer pulling vehicles. Relay harness utilizes inputs from the motorcycle to direct power from the battery to the appropriate trailer lighting circuit. 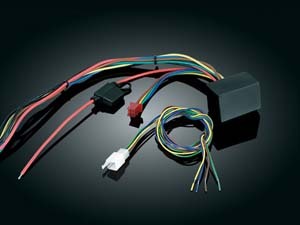 5 Wire Plus 1 or 4 Wire Plus 1: Our kits provide standard 5-wire output (run, brake, left turn, right turn, ground) or standard 4-wire output (run, left turn/brake, right turn/brake, ground) plus a bonus wire that can be connected as needed to provide fused 12v power to the trailer for compartment lights or keyless entry systems that are wired independently of the trailers essential lighting. 4-Wire Kits include flat-4 connector, 5-Wire kits do not include Receptacle Kits because the style of receptacle required varies by trailer manufacturer. 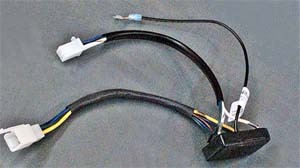 7671, 72, 75 Series: Safely & properly apply the load from the trailer lighting to the battery & not to the rest of the bike's wiring/relays/fuses with these Trailer Wiring Harnesses with Relays. Select the Universal or the Plug-&-Play kit that plugs inline underneath your seat to the bikes main rear harness. Both kits finish up by connecting directly to your battery & wiring to your trailer plug. 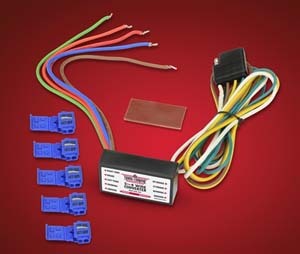 Add the 5 to 4 Converter for trailers with 4-wire connectors & it plugs right inline to the THK series Trailer Wiring Harness & Relay. This is the easiest wiring you will ever do! 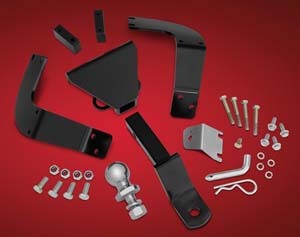 THK-59: 5-Pin Receptacle Kit for THK-091 Trailer Hitch. THR-14W: Plug-In Trailering Wire Harness for Harley 2014 FLH Models including Classic and Ultra Classic, Ultra Classic LTD, Street Glides, Road Glides, Tri Glides, and Fits all CVO, Screaming Eagle Versions (with the EXCEPTION OF ULTRA LTD CVO) Of These Models. 8 pin Molex - Fits 2014 FLH models including Classics, Ultra Classics, Street Glides, Road Glides, Tri Glides and all LTD, CVO, Screaming Eagle versions of these models. 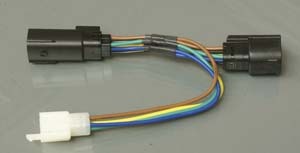 Simply unplug the tail light from the main wire harness under the seat, and plug in the mating male and female connectors to make an easy plug-in connection with our Isolator and/or 5-4 Wire Converter. NOTE: 2014 models are equipped with a new CAN-bus style wiring. You MUST also use an isolator, our # THR-IU-07. This will draw all the power for the trailer lights directly from the battery and not adversely affect the CAN-bus System. This will plug into the sub harness. THR-12: Pigtail w/30” of wire with no plugs for the THR-64 or the THR-IU-07 so you will have to cut and splice the harness together. 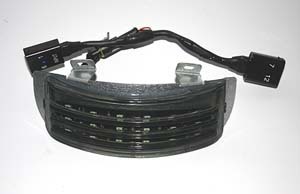 unplug the tail light from the main wire harness under the seat, plug in the mating male and female connectors supplied with 30” of wire in a loom. Add a mating trailer plug and you’re done! 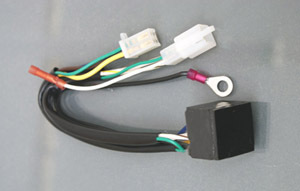 Has five wires (separate tail, turn, and brake wires). A 4 wire trailer system will require a 5 to 4 wire signal adaptor, available from eGlideGoodies as part number THR-64. 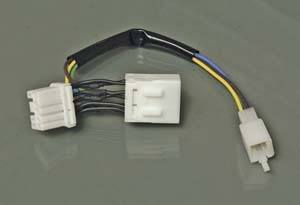 THR-13: Shorter pigtail that is connectorized and has a plug to mate to the THR-64 or the THR-IU-07 and provides the easiest way to install a wire harness. 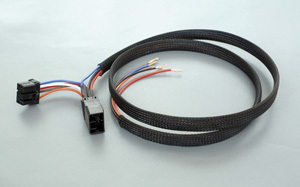 Simply unplug the tail light from the main wire harness under the seat, and plug in the mating male and female connectors to make an easy plug-in connection with our Isolator and/or 5-4 Wire Converter. 8 pin AMP - Fits Softail 97-10 except SE, Street Glide 06-09, Road King 97-13, Road Glide 97-09, Classic, Ultra, Limited & SE- all 97-13, Tri Glide - All. 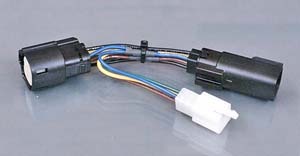 THR-28: Plug-In Trailering Wire Harness for Harley-Davidson CVO Models CVO 6 pin Molex - Fits 2010 and newer FLHX (Streetglide) & FLHXR (Roadglide Custom) Simply unplug the tail light from the main wire harness under the seat, and plug in the mating male and female connectors to make an easy plug-in connection with our Isolator and/or 5-4 Wire Converter. THR-38: Plug-In Trailering Wire Harness for Harley-Davidson CVO SE Models 8 pin Molex - Fits 2010 & newer FLHXSE (CVO Streetglide) & FLHXRSE (Roadglide CVO). 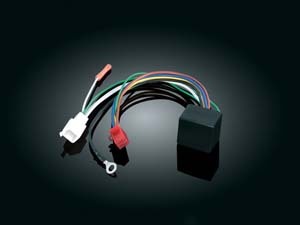 Simply unplug the tail light from the main wire harness under the seat, and plug in the mating male and female connectors to make an easy plug-in connection with our Isolator and/or 5-4 Wire Converter. THR-64: Adapt your motorcycle’s five wire system to power a four wire trailer system. If the trailer you want to tow has a four wire system (combined brake and turn signal bulbs) you will also need a five to four wire converter in line before the isolator. 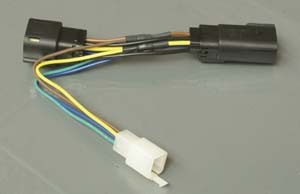 This product must be used when adapting a trailer with a 4 wire system to any motorcycle, which all use a 5 wire system. THR-127: eGlideGoodies delivers a much requested 5 to 4 Wire Converter for your trailer. This converter is the same high quality seen in all other trailer wire harnesses, and provides a quality 5 wire to 4-way flat trailer connection. 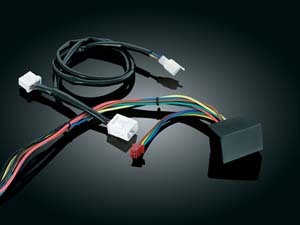 It's color coded to match some Trailer Harnesses and is designed to universally fit the bike or vehicle of your choice. 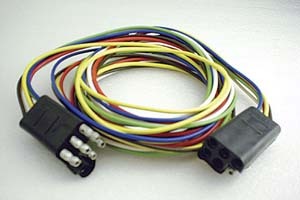 5-TO-4 TRAILER CONVERTER, 4-Way Flat Trailer Output, Color Coded Wires. 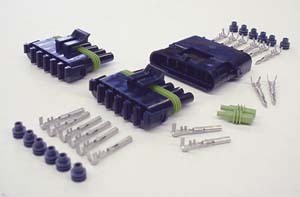 TW-C002: This Molded 6-Wire Trailer Connector is manufactured with a 60" loop of 16 gauge wire that can be cut as desired for splicing into or replacing existing wiring. Why a six wire connector? All motorcycles and most trailers have separate tail, brake and turn signal wires, plus the ground. This requires a trailer wire connector with five wires. The sixth terminal or wire can be used for an interior light or other accessory and is usually wired to have power when the ignition is off. THR-IU-07: When wiring your motorcycle trailer using an isolator is required to prevent damage to your factory motorcycle wiring and trailer wiring components. This universalisolator to be plug-n-play with sub-harnesses and converters. It has a 36" wire loom to reach your trailer hitch tongueand trailer plug. Wiring the unit is easy when you follow the included wiring diagrams and instructions. The small 3"x 1 ½" x 1" size of the isolator and the adhesive backing make it easy to mount in an out-of-sight locationlike under the seat for example. 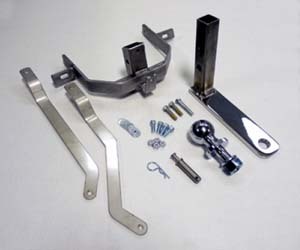 The kit is a universal isolator; meaning it works on any model trailer hitch. THR-614: The best you can buy. Marine-quality and fully sealed to keep out water, dirt and prevent corrosion. No splicing, soldering or crude bulky connections. Simply slip the seals over your wires, strip and crimp on the snap-action locking terminals, push the terminals and seals into the housing, snap the seal retainer cap closed and you have a very high quality and sanitary trailer connector. Also included is an additional male plug with seals to use as a weatherproof dust cover on the motorcycle side female connector when not towing your trailer. Set includes 1 female and 2 male housings, all crimp connectors and wire seals, plugs for unused wire sockets, spare terminals and detailed instructions. 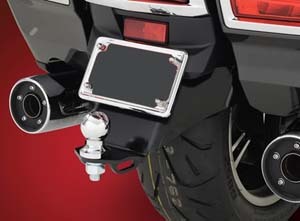 RMB-921: This Receiver Hitch BagGreat new item to keep your Receiver Hitch Mount from rolling around in your trunk or saddlebag. 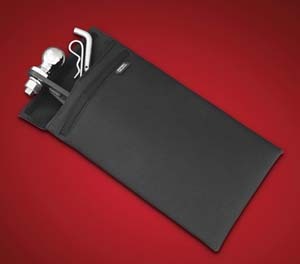 This 16 ¼" x 8 ½" padded case is designed to accommodate most receiver mounts to keep them from rattling or rollingaround. Case quickly closes with a hook and loop fastener allowing not only quick storage but easy removal of your mount for use. Not only does this make a great hitch mount case, it can be used to add extra padding to any other item stored inyour trunk or saddlebag. Sold each and made in the USA. HB-C: Chrome Steel Hitch Ball with Bolt. 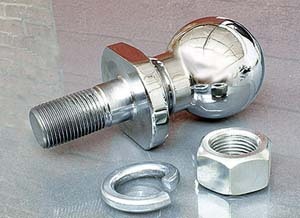 High quality hitch ball with a durable, attractive nickel chrome finish. Also features fine threads for superior holding strength and is tested to meet U.S. V-5 towing specifications. 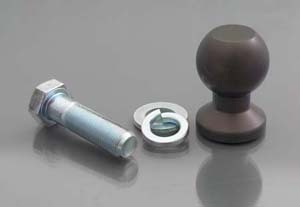 HB-B: Lightweight aircraft billet aluminum ball, hard-coated to prevent wear, weighs less than a pound. This is the only ball to consider for motorcycle towing! 1 7/8". 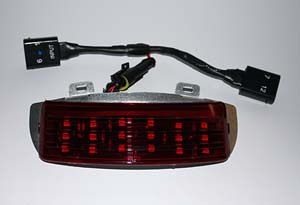 THR-7100: This new Red LED Tail/Brake Fender Light for Street Glides and Road Glides (U.S. models only) is a complete plug and play unit including lens, housing, LEDs, harness, connector. 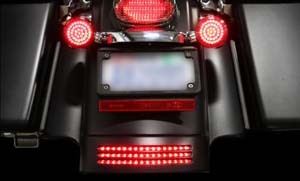 It features three rows of 16 red dual intensity LEDs (for a grand total of 48 of those bright little life-savers) and adds an additional LED brake light for your bike while providing both running and brake modes. This light comes with a red lens, and has a lifetime warranty. 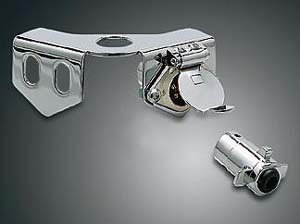 NOTE: Also works with THR-09 Completely Hidden Trailer Hitch for 2009 Road Glide and Street Glide models. 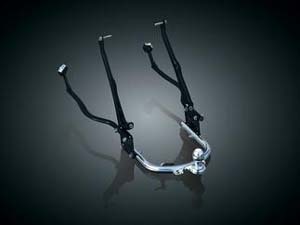 Fits: '14-15 Street Glide/Street Glide Special, Road Glide, Road Glide Special (Does not fit CVO Versions, Fits US models only). THR-7110: Similar to above for 2010 - 2013 Road Glide and Street Glide models. 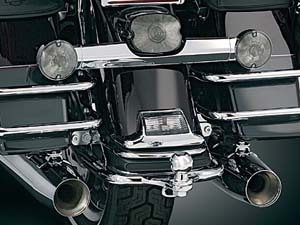 THR-7119: Similar to above for 2006 - 2009 Road Glide and Street Glide models. THR-7105: Similar to THR-7100 but in smoke. THR-7115: Similar to THR-7105 for 2010- 2013 Road Glide and Street Glide models. 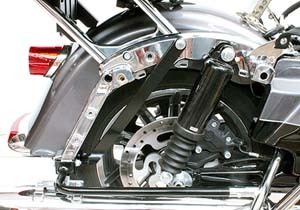 THR-7159: Similar to above for 2006 - 2009 Road Glide and Street Glide models.